Sunroof, NAV, Heated Seats. Alpine White exterior and Black SensaTec interior, xDrive30i trim. FUEL EFFICIENT 29 MPG Hwy/22 MPG City! AND MORE! KEY FEATURES INCLUDE All Wheel Drive, Power Liftgate, Rear Air, Back-Up Camera, Turbocharged, iPod/MP3 Input, Onboard Communications System, Keyless Start, Dual Zone A/C. BMW xDrive30i with Alpine White exterior and Black SensaTec interior features a 4 Cylinder Engine with 248 HP at 5200 RPM*. OPTION PACKAGES NAVIGATION SYSTEM Remote Services, Advanced Real-Time Traffic Information, Apple CarPlay Compatibility, 1 year trial, In-Dash CD Player, PANORAMIC MOONROOF, WHEELS: 19 X 7.5 (STYLE 692) V-spoke, Tires: 245/50R19 AS Run-Flat, HEATED FRONT SEATS, DRIVING ASSISTANCE PACKAGE Active Driving Assistant, rear cross-traffic alert, Active Blind Spot Detection, Lane Departure Warning, HEATED STEERING WHEEL. Rear Spoiler, Privacy Glass, Remote Trunk Release, Keyless Entry, Steering Wheel Controls. Horsepower calculations based on trim engine configuration. Fuel economy calculations based on original manufacturer data for trim engine configuration. Please confirm the accuracy of the included equipment by calling us prior to purchase. Heated Seats, Moonroof, Nav System. FUEL EFFICIENT 29 MPG Hwy/22 MPG City! Alpine White exterior and Black SensaTec interior CLICK NOW! KEY FEATURES INCLUDE All Wheel Drive, Power Liftgate, Rear Air, Back-Up Camera, Turbocharged, iPod/MP3 Input, Onboard Communications System, Keyless Start, Dual Zone A/C BMW xDrive30i with Alpine White exterior and Black SensaTec interior features a 4 Cylinder Engine with 248 HP at 5200 RPM*. OPTION PACKAGES NAVIGATION SYSTEM Remote Services, Advanced Real-Time Traffic Information, Apple CarPlay Compatibility, 1 year trial, In-Dash CD Player, PANORAMIC MOONROOF, WHEELS: 19 X 7.5 (STYLE 692) V-spoke, Tires: 245/50R19 AS Run-Flat, HEATED FRONT SEATS, DRIVING ASSISTANCE PACKAGE Active Driving Assistant, rear cross-traffic alert, Active Blind Spot Detection, Lane Departure Warning, HEATED STEERING WHEEL. Rear Spoiler, Privacy Glass, Keyless Entry, Remote Trunk Release, Steering Wheel Controls. Horsepower calculations based on trim engine configuration. Fuel economy calculations based on original manufacturer data for trim engine configuration. Please confirm the accuracy of the included equipment by calling us prior to purchase. Nav System, Heated Seats, Moonroof, Back-Up Camera, Rear Air. xDrive30i trim, Alpine White exterior and Black SensaTec interior. CLICK NOW! KEY FEATURES INCLUDE All Wheel Drive, Power Liftgate, Rear Air, Back-Up Camera, Turbocharged, iPod/MP3 Input, Onboard Communications System, Keyless Start, Dual Zone A/C BMW xDrive30i with Alpine White exterior and Black SensaTec interior features a 4 Cylinder Engine with 248 HP at 5200 RPM*. OPTION PACKAGES NAVIGATION SYSTEM Remote Services, Advanced Real-Time Traffic Information, Apple CarPlay Compatibility, 1 year trial, In-Dash CD Player, PANORAMIC MOONROOF, WHEELS: 19 X 7.5 (STYLE 692) V-spoke, Tires: 245/50R19 AS Run-Flat, HEATED FRONT SEATS, DRIVING ASSISTANCE PACKAGE Active Driving Assistant, rear cross-traffic alert, Active Blind Spot Detection, Lane Departure Warning, HEATED STEERING WHEEL. Rear Spoiler, Privacy Glass, Remote Trunk Release, Keyless Entry, Steering Wheel Controls. Horsepower calculations based on trim engine configuration. Fuel economy calculations based on original manufacturer data for trim engine configuration. Please confirm the accuracy of the included equipment by calling us prior to purchase. The popular BMW X3 Sports Activity Vehicle has been reborn and is available at Habberstad BMW of Bay Shore in three invigorating styles. The all new BMW X3 lets you seize any reason for adventure, whether it be in the BMW X3 sDrive30i, BMW X3 xDrive30i, or BMW X3 M40i. Comfortable interiors, powerful engines, and intuitive controls come together in a vehicle where the passion for driving is more apparent than ever. With a passion for performance, the BMW X3 comes with an 8-speed Steptronic Sport Automatic Transmission with shift paddles, allowing you to drive free. The 2018 BMW X3 is the perfect vehicle for all of life’s adventures. With 8 inches of ground clearance for navigating conditions from sand to snow, you won’t ever be slowed down. Available suspension options, including Adaptive M sport suspension for the M40i also ensure you comfort and control when you’re cruising the highway. Packing for your destination comes easy in the All-New BMW X3. Cargo storage capacity of an impressive 62.7 cubic feet with split folding rear seats accommodates for everything your adventure requires. When you finally get behind the wheel you will be greeted by a seamless interface full of intelligent connections. The optional navigation system featuring the latest version of iDrive, puts a driver’s world at your fingertips with an intuitive interface that responds to a touch, voice commands, or optional Gesture Control. Essential driving information appears on the optional 8.8 instrument screen. As you put the X3 in motion you will be powered by the latest BMW TwinPower Turbo 2.0 liter 4-cylinder inline engine providing a power boost and fast acceleration. Dynamic Stability Control will go to work providing remarkable tenacity on slippery road surfaces. If the intelligent chassis senses over, or understeer, it modulates engine power and can apply brakes individually to help keep the vehicle under control and going the intended direction. 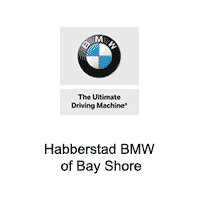 Now with limited time offers available exclusively at Habberstad BMW of Bay Shore there will be nothing to stop you from owning the luxury vehicle that everyone wants but few dare to obtain. Be sure to visit our showroom soon because with offers as attractive as these, even our always large inventory will not last long. Do not miss your best chance to get into a new BMW X3 at a price you’ve never seen before and may never see again. Regardless of whether you reside in Brightwaters or Baywood, Islip or Bay Shore, or beyond the immediate surroundings of our Long Island BMW dealership, we’re sure you’ll find it worth the trip to see the 2018 BMW X3s now available at Habberstad BMW of Bay Shore.